Of course this year brings a bombardment of retail advertisement for Christmas gifts for anyone in your life. Recently, I have been getting more and more perturbed by the ads that are running. Last year, one retailer ran ads telling viewers that “you” are Santa. This year, it seems to be even worse. Forgive me for the following rant; I need to get this out! So, JC Penney is at it again telling its audience that they are Santa with their “Who’s your Santa” campaign. Best Buy is urging everyone to outdo or outsmart Santa. Since when do we not need Santa Claus in our lives at the holidays? 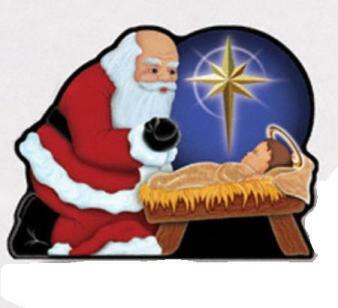 Do retailers really believe they can remove Santa from the picture, like they have with the baby Jesus? I feel this is an illustration of how commercial Christmas has become. We have lost sight of what this season is really about. I am becoming resentful these companies telling us that we are Santa, not to mention… WHAT if our kids are watching and listening to this… Are they going to question whether Santa Claus exists and come running to us to ask if WE are indeed Santa just as those commercials say? The Best Buy ads get me the most. I mean really, are we parents here to make Santa look bad? And if that is the case, are we really just making ourselves look bad? I don’t get the rationale behind this campaign…I mean, I do. But I don’t. I understand the business case for the campaign, but I don’t get the personal case for it. Did they think about their demographic at all and what message they might be sending to parents and also are they concerned in the least that children might be watching and wondering why Santa is being vilified. Well, I don’t actually think children are thinking this when they happen to see this type of commercial. I am not 100% sure they get the concept. Maybe all they see is Santa! I think Target has gotten it right. “Santa has elves and You have Target.” I like this concept as they are not belittling or canceling out Santa all together. So, I brought my business there. I haven’t shopped at Target in a long while, but my Christmas shopping this year centered around Target and they had some awesome deals! I was very pleased with my purchases and the quality of those purchases. Not to mention, my buck went pretty far there! I was very excited indeed. I did a great deal of shopping at Walmart also as they have some great buys on the toys I need, plus I LOVED the “Imma shopping Ninja” commercial! Hell, I wanted to be a shopping ninja and a shopping ninja I was! I got in and out completely unscathed. I know there is a lot of ranting about Walmart and how much people hate it. I was once in that boat. A couple of years ago, I was shopping at the most awful Walmart ever to exist. You see, I lived just outside of Oakland, CA and the closest Walmart was near its airport. I hated the fact that I had to go to Walmart because the customers and the cashiers were the most abominable people you could imagine. When I was 8 ½ months pregnant, I went to this particular store to grab a few decorations and a few gifts to put under the tree in case my baby came in time for Christmas (but he didn’t)… I was standing in the checkout line and to my surprise a formidable woman budges in front of me in line with a cart-full of items and made it look like she was with her friend. In order for her to get by me, she had to elbow me in the baby belly. This place infuriated me. My only peace of mind came when she did finally check out and her credit card was declined. She had to leave everything behind and leave the store. That’s a Karma for ya! I was pleased to say the least. I hate taking pleasure in others pain but she was the lowest of the low, the utterly conscienceless part of humanity that really get’s to me sometimes. We were so broke that I had no choice, I had to shop there…until a new one opened up in the next town. It was better…not by much…but at least it wasn’t full of gangsters and angry entitled people. I got in and out with no elbowing in the gut! Now, I live in the South, in a smallish town that has two Walmarts. Both are pretty decent and have had no issues like the good ol’ Walmart of Oakland. Oy vey! So, to all of you naysayer retailers out there: SANTA IS HERE TO STAY AND I WILL NOT SHOP AT YOUR STORE AS LONG AS YOU TRY TO CANCEL OUT THE TRUE SPIRIT OF CHRISTMAS! SANTA ROCKS! Oh, and so does the Baby Jesus…He is the reason for the season after all. And another thing, I will always believe in Santa! Okay, enough of my rant. Have to get back to work and be preoccupied with how filthy my house is and the fact that I still have numerous presents to wrap. I really have better things to do with my time other than work, but I guess the bacon isn’t going to earn itself! This entry was posted in Uncategorized and tagged ads, baby jesus, best buy, christmas, commercial, jcpenney, rant, santa claus, shopping, target, walmart. Bookmark the permalink.